You might be surprised just how simple, quick and easy it is to make homemade hot pepper flakes from the hot peppers growing in your garden! Hot pepper flakes are a great way to spice up everything from morning eggs to a slice of pizza. And if you have a bumper crop of hot peppers growing in your garden this year – making homemade hot pepper flakes is the perfect way to preserve them. The best part of all, it doesn’t require a lot of fancy canning and preserving equipment to make them. All you need is a cookie sheet, an oven, a coffee grinder or food processor, and of course, a supply of hot peppers – and you’re in business! You can make homemade hot pepper flakes from any hot pepper. You can make hot pepper flakes from any hot pepper growing in your garden. The formula is simple. The hotter the pepper you use, the hotter the flakes will be! Cayenne and red-hot chili peppers are the traditional choices, but it can be fun to experiment with different varieties and colors of peppers. You can even mix and match hot peppers in the same batch. It allows you to create a blend of homemade hot pepper flakes unique to your garden! Before Your Make: Before working with hot peppers, be sure to take a few precautionary options. Always use a good pair of rubber gloves to keep the hot peppers from burning your hands. Also be careful not to touch bare skin or rub your eyes during the process. You will know it if you do! Much like when preserving or canning any vegetables, select only firm, ripe and blemish-free peppers. Rinse and clean the peppers with water, and place on a clean towel and dry. Next, remove the top stem by slicing off the top of the pepper with a sharp knife. Do not remove the inner seed core. This is what will give the homemade hot pepper flakes their heat! Place the peppers on an aluminum foil-covered baking sheet. Be sure to protect and cover your baking sheets prior to placing the peppers on them. If you leave uncovered, you will forever be creating hot cookies and more – anytime you bake! Hot peppers can take a long time to air dry! Although peppers can be dried traditionally by hanging, they can take weeks or even a month or more to dry. 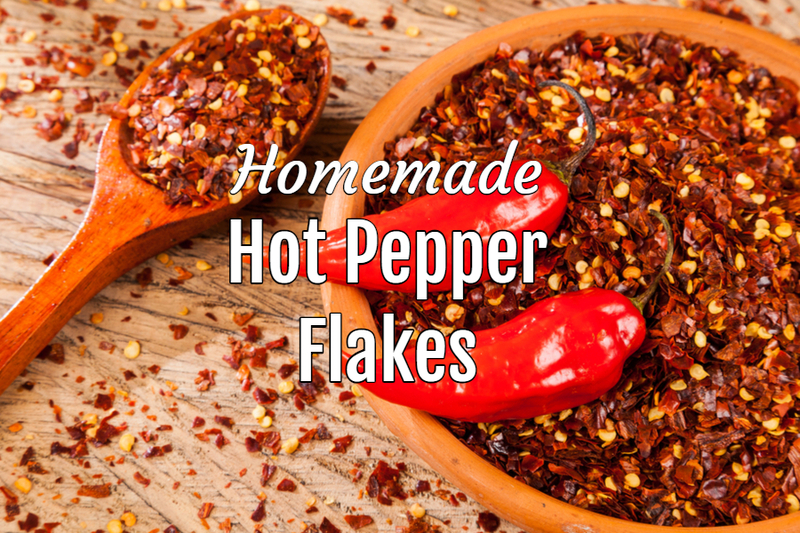 With the oven method, you can have finished hot pepper flakes in just a single day. Place the peppers in the oven. You can fill both racks with cookie sheets if you have enough peppers. For most ovens, you can fit up to 4 total baking sheets of peppers. Turn the oven to 180 degrees, and go about your day. The length of time it takes to dry and roast will depend on the size and moisture content of the peppers. For most small varieties such as cayenne or red chili – it will take between 8 and 10 hours to completely dry the peppers. It is best to keep the kitchen well ventilated with an open window during this process. It can create a bit of heat in the air if air flow is not present. When the peppers have turned crisp and dry, remove from the oven. Allow the peppers to cool completely. Now its time dry and store! Once again, put on protective gloves before touching the peppers. Place the peppers into a food processor or food chopper. Coffee bean grinders work extremely well for this too. You can even create your own hot pepper powder by pulsing until the peppers create a fine powder. Just run the mix through a sifter or screen to remove the seeds to filter. Hot pepper flakes and power will keep for 6 months to a year when stored in an air-tight container. You can also store in the freezer to keep fresh longer. This Is My Garden is a gardening website created by gardeners, for gardeners! We publish two garden articles every week, 52 weeks a year. Sign up below to follow along, and follow us on Facebook @ TIMG as well. You can also share your backyard gardening tips or stories with us at info@thisismygarden.com to be our next feature! This article may contain affiliate links.